On Monday, a large amount of ash like mud was reported along the Swedish west coast. According to coast guards, the strange substance is drifting somewhere between Norway, Sweden, and Denmark due to weather and currents. A geologist was asked to take a look at it, and the best-fit guesses until the laboratory results are in, is that a methane deposit has been heated causing a mudcano to form and erupt under water. 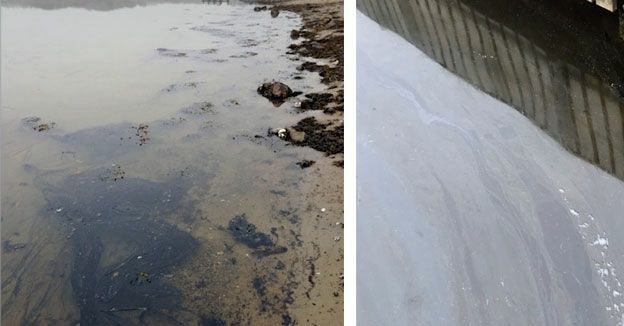 It was at lunchtime on Monday when the Coast Guard started receiving calls from baffled boaters and residents reporting a strange substance – similar to oil, but neither sticky nor smelly – covering the surface of the sea along the west coast of Sweden and now somewhere between Norway, Sweden, and Denmark. When officials reached the location of the strange phenomenon, they find out it wasn’t oil and started wondering what it could be. Their first guess: something of biological nature, like an algae bloom, bacteria falling from the sky or a similar phenomenon. But officials have then excluded this hypothesis too. They haven’t found any biological structures such as cells or chlorophyll. Probably another unknown underwater volcano. Meanwhile, samples have been taken and were sent to a lab for analysis to testify the geological hypothesis.